Taxi2Gate has made available several updates to the Lambert-St.Louis International Airport (KSTL) scenery for FSX. FlightOntario has released the freeware Ontario LandClass X for FSX. Download at the FlightOntario Website. TropicalSim has released the Flores Airport (LPFL) scenery for FSX (FS2004 version soon). Available at SimMarket. Thomas Röhl has posted another preview screenshot from the upcoming ICARO Eurocopter EC145 for FS2004. FranceVFR has released the Auvergne Photo HD scenery for FSX. Available at the Product Page and SimMarket. - High resolution photoreal scenery covering a French region. - 0.85 to 1 meter resolution ground texture made from aerial photography (IGN) retreated for an optimal visual rendition in FSX (summer only). - High resolution real 19 meter (LOD11) optimized custom mesh incuded. - All lakes and rivers have been entirely cut out and faithfully represented, reworked with bodies of landable water. - Water transparency effects for the whole scenery coverage. - Optional Waterclass and original water texture provided (depending on regions). - Extremely precise geo-referenced texture positionning is carried out in order to ensure a maximal compatibility with scenery add-ons for this region. - Process development is fully conform to the Microsoft FSX SDK, ensuring a maximal compatibility with future versions of Flight Simulator. - Open scenery concept allows an easy integration of scenery add-ons from other editors. FlightSim Developers (FSD) is holding a May Day Sale with 20% or more off select titles. Valid Through May 1st 2012. Angle of Attack has posted the 737NGX Engines preview video from the PMDG 737NGX Training Program. Pavel Pranov has posted several preview screenshots from the upcoming Mil Helicopters Mi-2 in X-Plane 10. 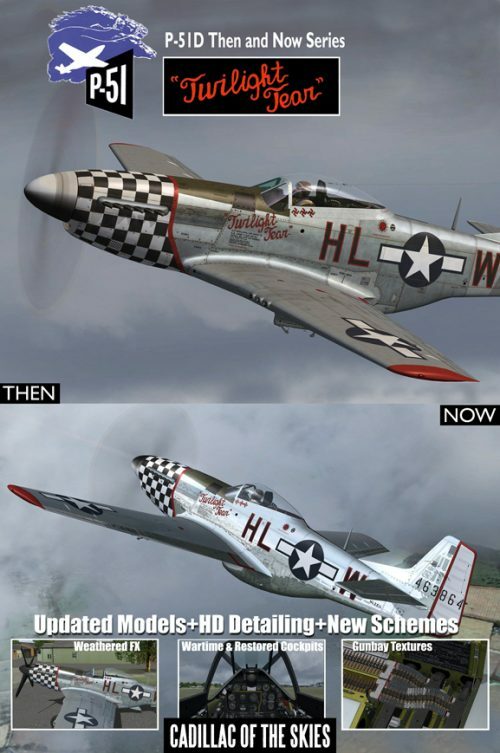 Warbirdsim has released the North American P-51D Mustang 'Twilight Tear' Then and Now Series Part 2 for FSX. Synchro-Soft has released the Boeing 737 Classic CFM56-3 Soundset Version 2 for FSX. Available at SimMarket. Ground Environment X Atlantic and Pacific Tropics for FSX is now also available to purchase at SimMarket. - Complete coverage of the Pacific and the Atlantic. - Enhanced textures to assist in rendering clear visuals as low as 250-500ft. - High volume autogen layout with optimizations for maximum performance. - Updates GEX Europe in the southern regions when installed with GEX EU. - Major upgrade for GEX North America users when installed with GEX NA. - Synchronizes all GEX regions. No texture switching between regions. - 1m/pixel - 1024x1024 Textures - No excessive resolution to render. - Full texture support for SceneryTech and Xclass landclass products. - Automated file backup system with merged region backup storage. - Sync patches provided for UTX USACanadaUT Alaska and Europe. - 2D enhancements produce simulated 3D depth in textures. - Textures derived from licensed Arial and Satellite imagery. - All seasons including snowy winters and mountain terrain. - FSX tree render issue addressed in autogen annotation. - Realistic custom designed night lighting textures. - Improved default FSX road night lighting. - Highly detailed aerial views. FSBreak Episode 111: Kevin Miller - Republic Seabee Interview is now available at the FSBreak Website. Drzewiecki Design has posted more preview screenshots from the upcoming Polish Airports Vol.3 for FSX and FS2004. Aerosoft has posted several preview screenshots of the virtual cockpit from the upcoming Airbus X Extended for FSX. Aerosoft is offering 25% discounts on all products from Flight1 Software. Valid through May 1st 2012. SoulMade Simulations has posted another preview screenshot from the upcoming de Havilland DHC-2 Beaver for X-Plane. Just Flight has released the English Electric Lightning supersonic fighter-interceptor for FSX. Details at the Product Page. - A total of seven high definition liveries are included, featuring plenty of polished, heat-scorched and rivet-filled metal surfaces! Outerra has posted several terrain self-shadowing previews from the Outerra Terrain Engine currently under development. McPhat Studios is Working on a Fokker 50? McPhat Studios has posted several pictures from their newest project, which appears to be a Fokker 50? Twentynine Palms Scenery Design has released the Tree Library - Part One for developers. Details at the Product Page. - Five high detailed tree models. - Formats: 3ds, obj, FS9 MDL, FSX MDL. - MDL-files are already tweaked (tweaks described in the manual). - 1024px² base texture (bmp 32bit, bmp 24bit, bmp DXT1, opacity map). - Seasonal textures (summer, fall, winter). - Licence for commercial use. Peter Cos from Flightdeck Solutions has announced this year's Open House to be held on June 1st - June 2nd 2012. Nemeth Designs has posted Previews Part 1 & Previews Part 2 from the upcoming Eurocopter AS355 Ecureuil 2 for FSX. Dan Klaue has posted this promotional video of the recently released Carenado Piper PA-34 Seneca II for X-Plane. Alabeo has posted new smoke effect previews from the upcoming Extra 300S for FSX on the Alabeo Facebook Page. SoulMade Simulations has posted another teaser screenshot from the upcoming de Havilland DHC-2 Beaver for X-Plane. TropicalSim has posted more previews from the upcoming Flores Airport (LPFL) scenery for FSX and FS2004. 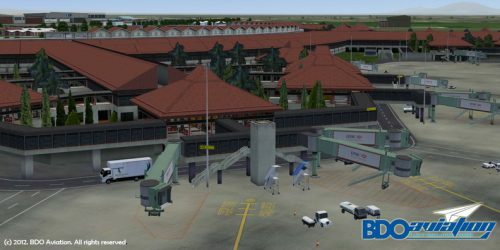 The recently released BDOaviation Soekarno–Hatta International Airport (WIII) is now also available at SimMarket. - Detailed terminal building, apron, taxiway, runway. The recently released Flight Replicas Piper PA-18 Super Cub Ultra for FSX is now also available at SimMarket. - Camping, pre-heating and storage equipment. Golden Age Simulations has posted the first preview pictures from the Ryan ST-A project for FSX. Flysimware has posted several preview screenshots from the Cessna 195 currently under development for FSX. FlyJSim has posted new exterior model renders from the upcoming Boeing 727 Series for X-Plane. Flying Stations has posted two preview videos from the Hawker Sea Fury under development for FSX and P3D.